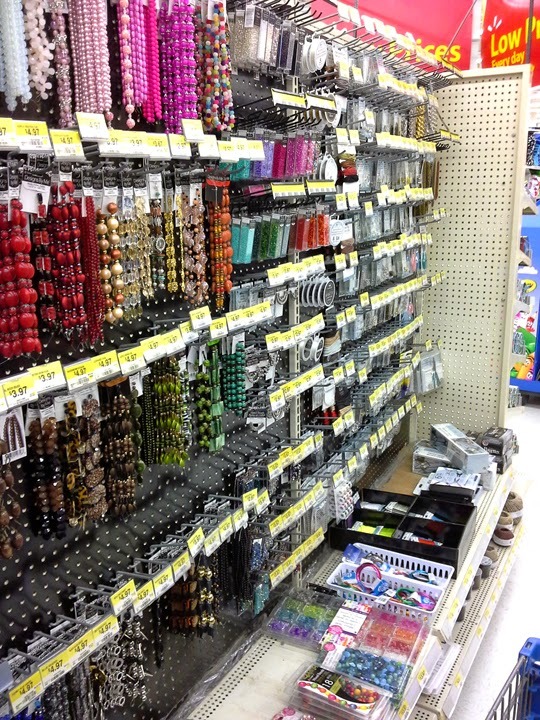 I have been asked many times where to buy beading supplies when you do not have a bead store close. 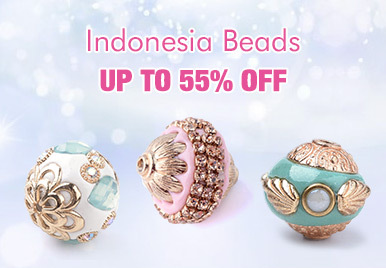 You don’t have to necessarily go online or drive a long distance to a beading store, of course you probably want to do that every so often just for the fun of it. Almost all your supplies can be bought at your local discount store. I went shopping at WalMart and was able to find almost everything I needed. The items I will be listing below are affordable too. 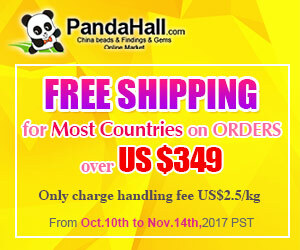 If you spend about $40.00 - $50.00 you can be on your way to setting up your own beading work area. My store is in Canada, so of course my prices will be higher than if you are in the US. Sorry I am not sure of international prices. I started my search in the craft department. I don’t know about your Walmart but mine has cut down the craft department down by 2/3’s over the last couple years. 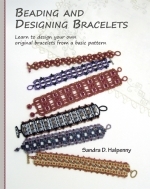 I still was able to find enough supplies though to make the bracelet pattern below. 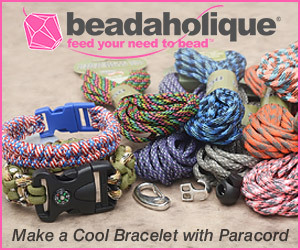 Of course the first thing you need are beads. The craft department didn’t have as many choices as they used to have, but I still was able to find some. 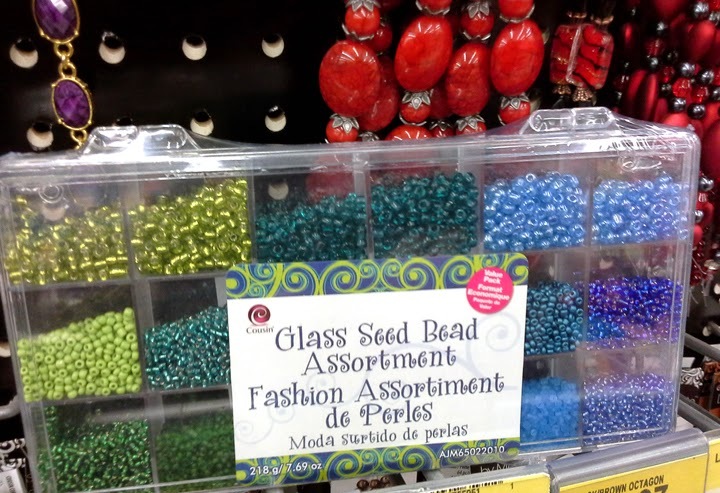 Most of the seed beads that are sold at discount stores are Czech Glass beads. They can be beautiful too and the uneven finishes can add dimension to your piece. Please see the bracelet pattern below which has been made and designed with the beads from WalMart. In these pictures here it shows the seed beads I found. 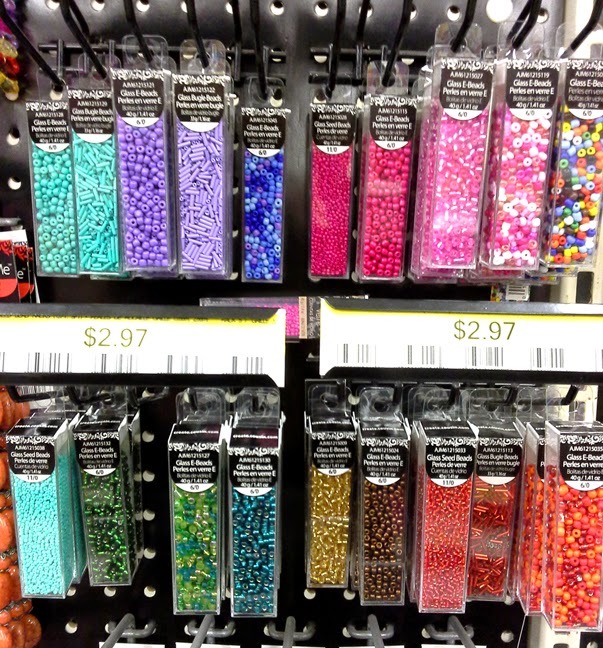 They also had a small wall of a variety of fancier beads. The bracelet below uses plastic crystals that I found in the kids craft beads section. 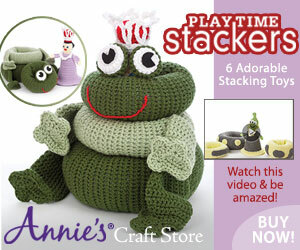 Great for everyday or even for your children. 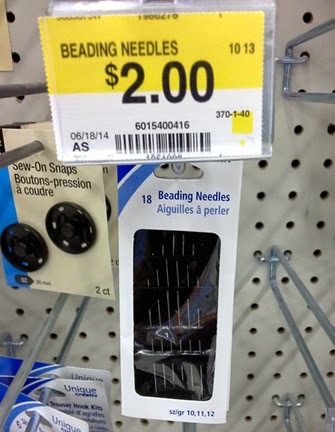 My WalMart no longer sells beading thread. So I took a few steps over to the sewing department and found some strong quilting and button thread. This thread is very similar to Nymo thread and should work fine for many of the things you are making. 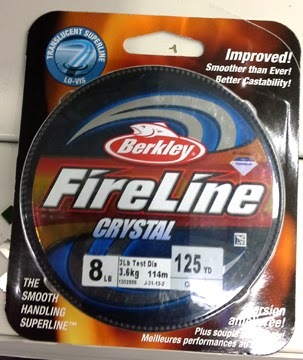 I then headed over to the fishing department and did find Fireline fishing line. My Walmart only had 8lb and up. I have never used the 8lb, but they usually have 4lb and 6lb, which are my favorites. for the "Dime Store Bracelet" below, I used 6lb Fireline that I had bought on a previous trip to WalMart. If your store doesn't sell the right size you can always request to see if they could carry it. So I looked all over the place through the bead section in WalMart and couldn't find any needles. I thought what the heck??? So again I took a few steps to the sewing department and that is where I found beading needles. The needles look like they would work with no problems. They were also only $2.00. Look how many you get too. The package has 18 needles, what a great deal. And if they break fast, they are affordable enough to buy a couple of packages. 4. ScissorsI found a lot of scissors. 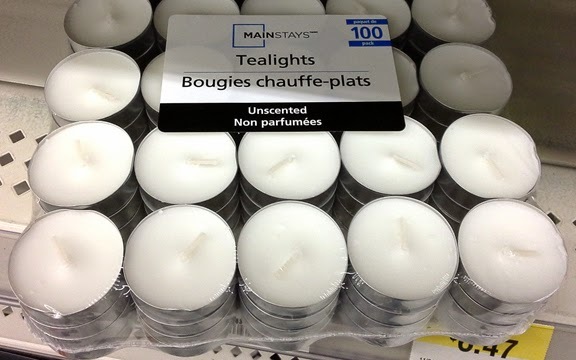 I first found some in the craft department. Those are the titanium ones. I then headed over to the school supplies and found more. You might want to get a couple of scissors. A very good small sharp pair for thread and a kids scissors for cutting Fireline. No problem finding a good choice of styles. 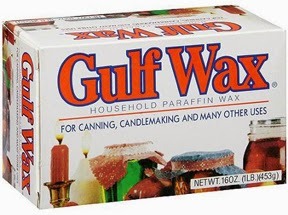 Remember though, if you are using Fireline you do not need any wax. You would use it as is. I like to use trays with lower sides. If you are working with a tray that has the higher sides, after awhile your arms will start to hurt. I found several options at WalMart. 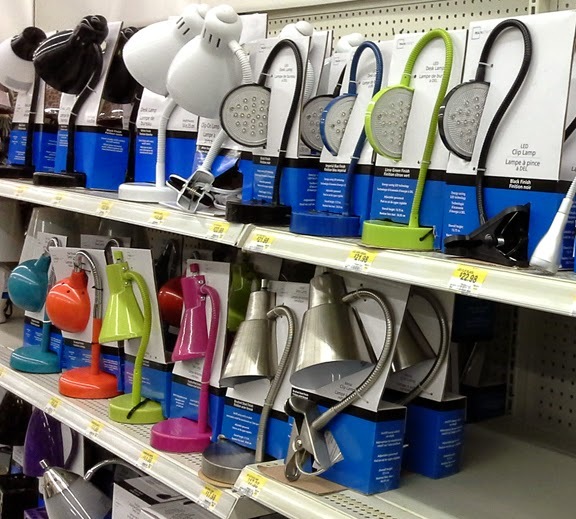 In the summer section I found several plastic choices. 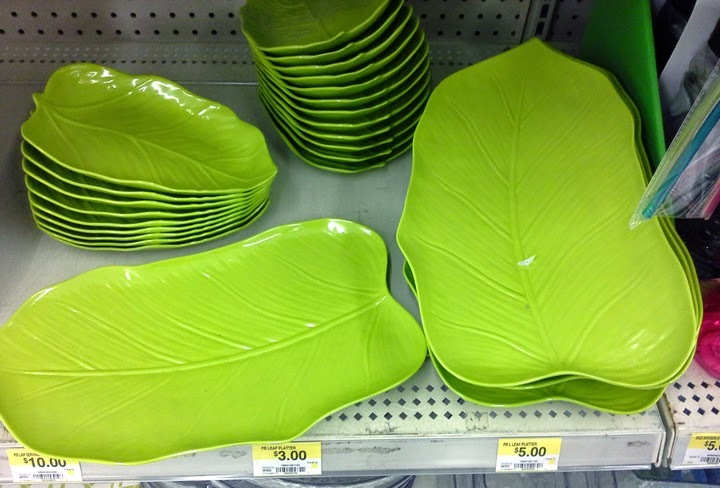 I especially like the green trays. it had the bigger one and also smaller ones that you can use to sort your beads if needed. The round one is a big serving dish, so pretty too. OK I also really like the longer and narrow tray, looks like it would really work too. These trays are actually very similar to the older wood trays that I use. This is how I lay out my work tray. You will especially need the no-slip vinyl shelf liner with the plastic trays. I first start with a lap desk. This is a flat board, about 12” x 10”, attached to a pillow. I forgot to look but the lap desks are usually sold at Walmart too. You can find them sometimes in the toy, craft or school department. - Cut a piece of no-slip vinyl shelf liner to fit (this keeps the tray in place, even if you have to get up really fast) and put that on the lap desk. - Then a tray, you do not want the tray to have edges that are too high, otherwise it will bother your arm if you are working on your lap. - Then put another piece of shelf liner and finally a place mat. I use a tightly woven place mat, so the beads don’t get lost in the texture of the fabric. It also keeps the beads from bouncing at you when you are working. - If I am working at a table, I just use the tray part. If I am working on my lap, I use the whole set up. A lot of people like using foam blanket material called Vellux to lay there beads on. I don't really like that stuff, I find my beads jump at me too much. I really like using a tightly woven place mat. 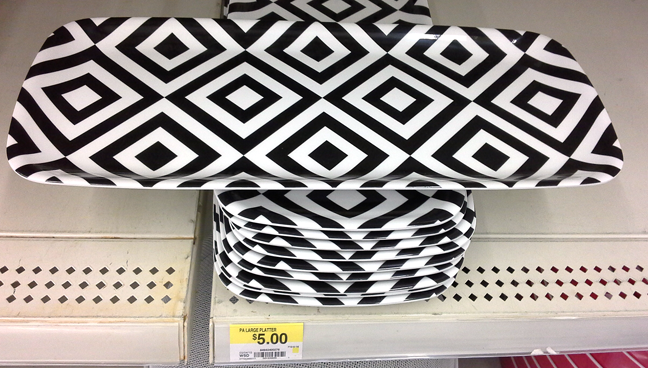 I checked Walmart in the kitchen department and believe it or not, they only had plastic place mats. 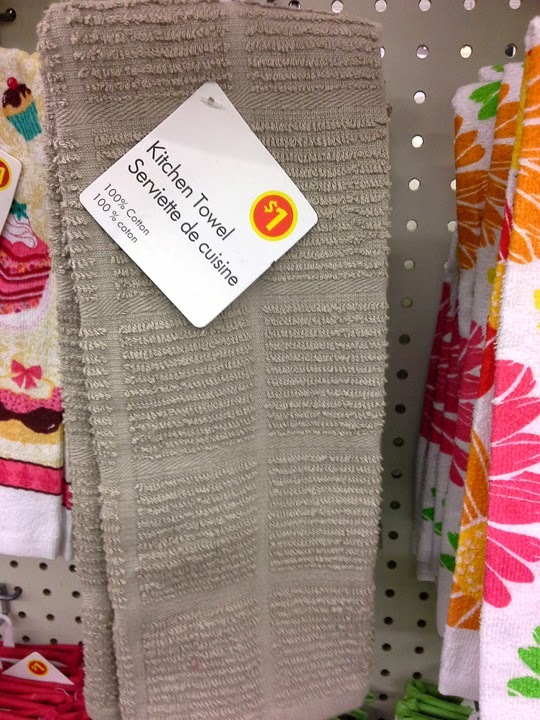 So I noticed hanging a tightly woven dish towel that was only a dollar. This towel should work perfectly for laying my beads on the tray. You should try to find a Neutral color and then when you bring it home press it flat before placing it on your tray. If you want you could also trim it to fit your tray perfectly. This towel I found had texture on the front, so after pressing it just flip it over. While I was in the kitchen department I looked for something to scoop up beads. I use an antique silver sugar spoon, but you do not need anything so fancy. I used to use an old measuring spoon. I also don't use bead bowls, so I just need to pick up beads from my tray. 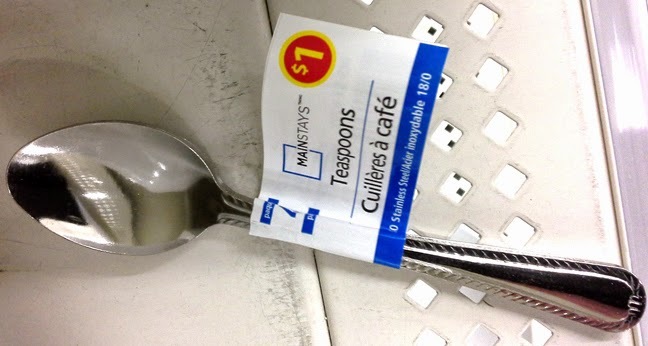 I found some perfectly fine teaspoons. And you can get a package of 4 for $1.00. These will work fine for scooping up seed beads. 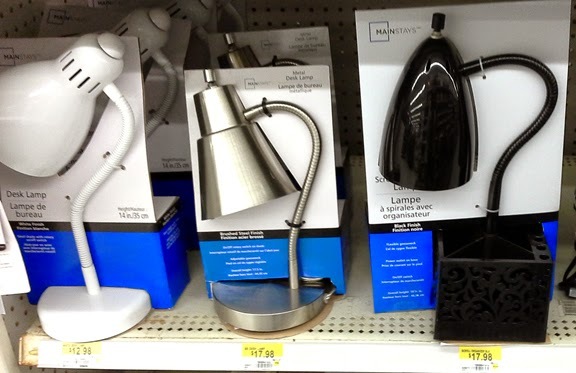 Again no problem finding lighting at WalMart. Tons of choices and all good prices. 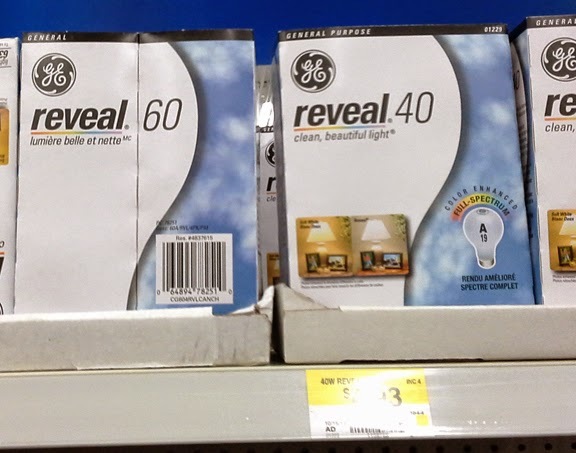 If you want a daylight bulb, just head over to the hardware department and you can find all kinds of natural light bulbs too. WalMart's craft department used to sell a magnifier that you would put on your head. I could not find it this time. I might have seen it at a US WalMart? 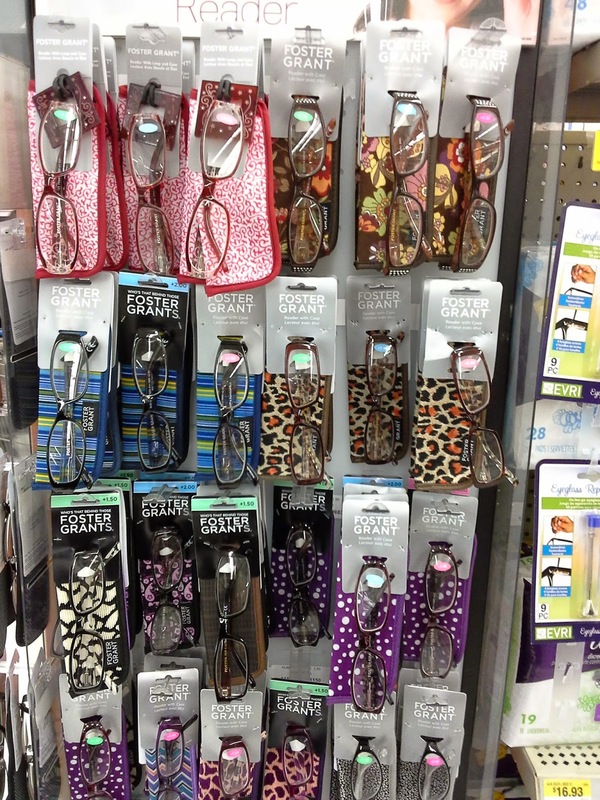 So I headed over to the reading glasses department, usually close to the pharmacy. Again, there were all kinds of choices. So if you think you will need magnification, pick yourself up a good pair of reading glasses. 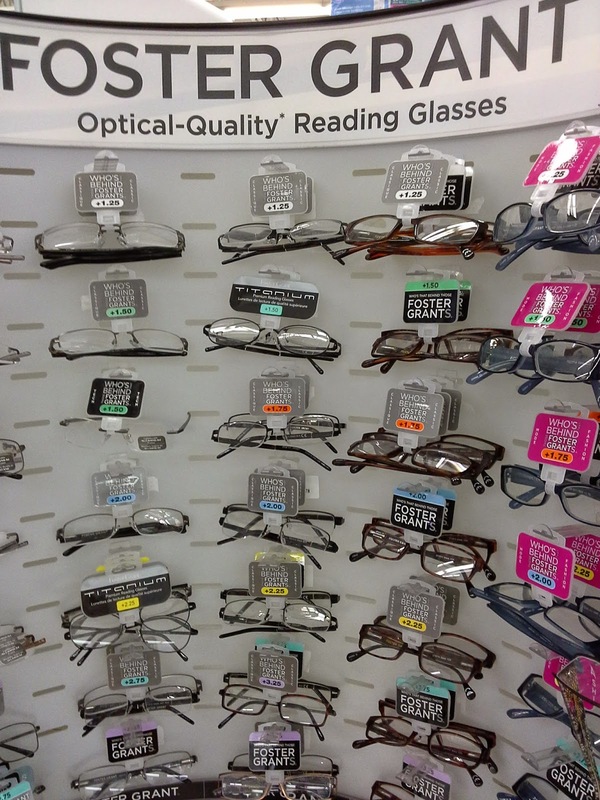 I would not buy a pair of cheap glasses though, no dollar store reading glasses. So now I have designed a pattern made with everything I bought at WalMart.